Back onto the mask theme that has driven a few posts out of me lately. I've found quite a few Ed Belfour cards for the frankenset so far; no surprise as Belfour's mask is a timeless classic, and as I mentioned recently comes in more than one color. Eddie started his career in Chicago, and boy did I hate seeing that red eagle play against the Leafs. 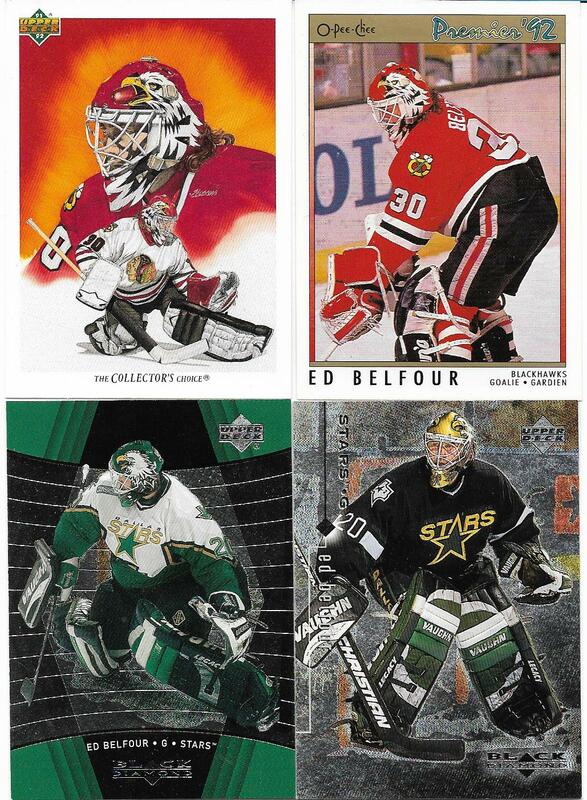 But there's no denying how good the mask looks, especially in the 91-92 Upper Deck team checklist art card. The only one of the 4 cards that doesn't give a great shot of the eagle is the 98-99 Black Diamond in the lower right. That card also represents a color of the mask I really don't remember him wearing, gold. That might be the one that be replaced over time. These 4 are all low numbers, 19,26,31 & 81. Can't go wrong with red and orange, the color of fire, especially on a mask. 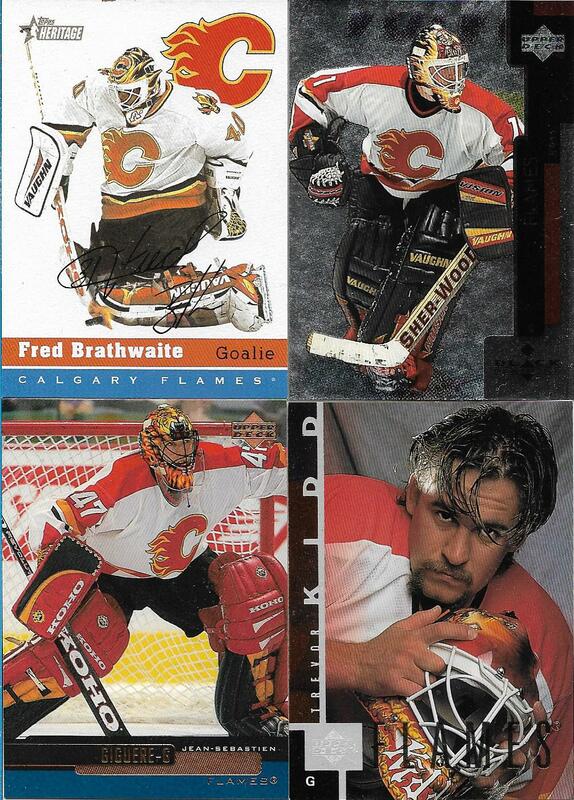 I love Fred Brathwaite's mask, with the C in flames on the forehead, and paying homage to the original location in Atlanta with the old flaming 'A' on his chin. Trevor Kidd always had cool designs on his mask, and although it is hard to see on his 97-98 Upper Deck card, the fire breathing dragons are no different. 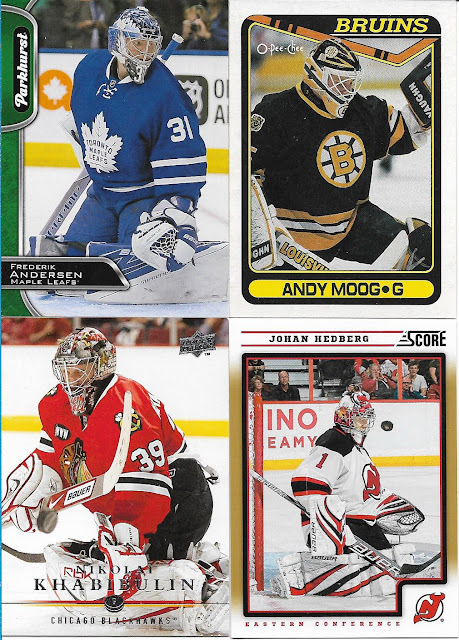 JS Giguere and Tyler Moss round out the quartet of Flames cards that are part of the set so far. Best shot of these 4? Easily the Johan Hedberg on the lower right. Great photo of Johan about to get hit in the mask with the puck; as long as it doesn't hit his trademark moose that is on the right hand side then all is good. The Andy Moog OPC card from 90-91 might feature the most boring mask that he sported as a Bruin. Some of his later designs were fantastic, especially the one with the growling bear. I hope to have one of those in this collection later on. Fredrik Andersen's "blue knight" and Nikolai Khabibulin's "Bulin Wall" mask also grace this group of 4. #'s 289-291-294 & 296 can be taken off the list. These 4 knock off cards 275-277-278 & 285. Seeing these masks made me think of some other mask cards I'd love to have. San Jose's Brian Hayward comes to mind, I also mentioned Andy Moog's Bruin mask. 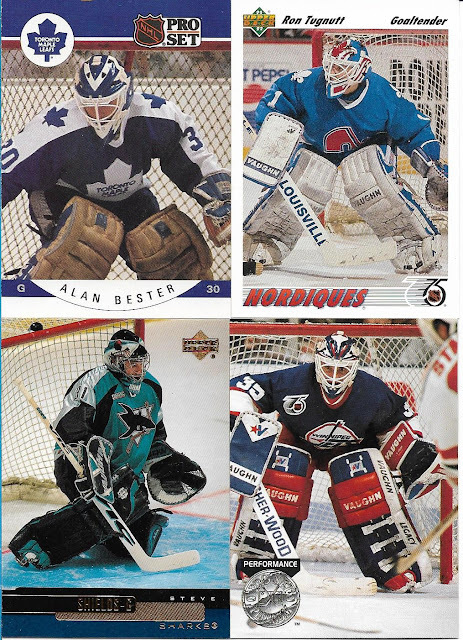 There are some older cards that come to mind, goalies such as Ken Dryden (bulls eye), Mike Palmateer (jagged tooth) and Murray Bannerman (Blackhawk logo) are three that come to mind right away. There's still lots of time to find those. Love the Kidd card, something different - he's giving those romance eyes. I couldn't stand Belfour after his brief stint with the Sharks. But he sure was one of the greatest goalies of that era. Blackhawks. i - love - them.